Soumya Sarkar is a professional cricketer from Bangladesh. 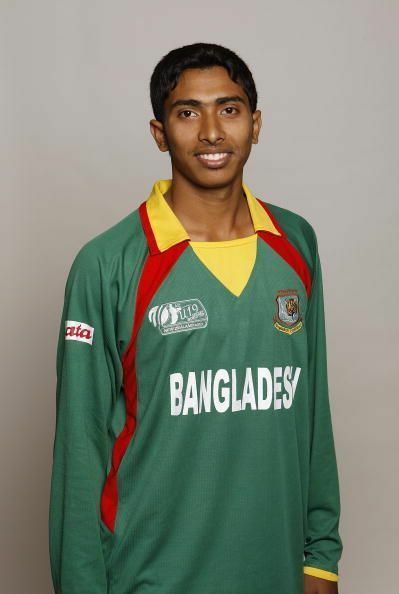 Born on 25 February 1993 in Satkhira, Khulna, he is a top-order left-handed batsman and right arm fast medium bowler. He holds the joint record with Mohammad Kaif and Umar Akmal for the most number of catches taken in a single World Cup match. Soumya’s father was a teacher. Inspired by his father, Soumya also wanted to become a teacher but his talent and interest in cricket made him choose cricket has a career. He played two Under-19 World Cups in 2010 and 2012 and made his First-Class debut for Khulna Division against Dhaka Division in the 2010–11 season. He plays for the Rangpur Riders in the Bangladesh Premier League, Prime Bank Cricket Club in the Dhaka Premier Division, and Khulna Division in the National Cricket League. Chandika Hathurusingha, Bangladesh's coach, who took charge in May 2014, had a look Sarkar and was included in the squad for Bangladesh's home series against Zimbabwe. He made his ODI debut in the final game on 1 December 2014 and scored 20 runs off 18 balls. After scoring his first ODI century on 22 April 2015, he was selected to join the national test team. On 28 April 2015, he made his test debut against Pakistan along with his teammate Mohammad Shahid at Khulna. He scored a total of 66 runs in two innings. Sarkar made his Twenty20 International debut for Bangladesh against Pakistan on 24 April 2015. However, he could not score a single run in the match. Soumya saw himself in headlines when he Mankaded Australia’s Jimmy Peirson in a quarter-final clash during the 2012 ICC Under-19 World Cup. Soumya scored a gritty 73 runs in the match, but Bangladesh ended up on the losing side. On 22 April 2015, Soumya made his maiden century with an unbeaten 127 runs in 110 balls, against Pakistan at Sher-e-Ban National Cricket Stadium and was named the Man of the Match.